The last 3 days have been an absolute whirlwind. BFF finally flew down, M went for his fitting, I went for mine, we went to get our florist settled and went to 2 site viewings, church and RSYC for BFF to get a rough idea. Will slowly blog about everything.. but for today, some information on 86 Creation. Our appointment was at 1pm at the florist located at Depot Heights Shopping Centre. For those who have no clue as to where that is, it’s near bukit merah/henderson. Wasn’t very difficult finding the shop since it’s located on the first floor and the sign is pretty huge. The options given for the bridal bouquet with that budget was honestly really ugly. Lots of leaves and flowers I didn’t really like – lillies, small roses. So I opted out of the bridal car decor and used that to upgrade my bouquet. The bridal car decor I could very well do my own or have none at all. Wasn’t very important to me.. What was important was that I had my exact flowers that I wanted. I finally settled with this photo as my inspiration! * as little leaves as possible as I wanted my bouquet to be all blush/ivory and lush. * a round bouquet instead of a flat top. I may not be an expert in this field, but from my basic knowledge of flowers this package is actually still okay, even with the top up! 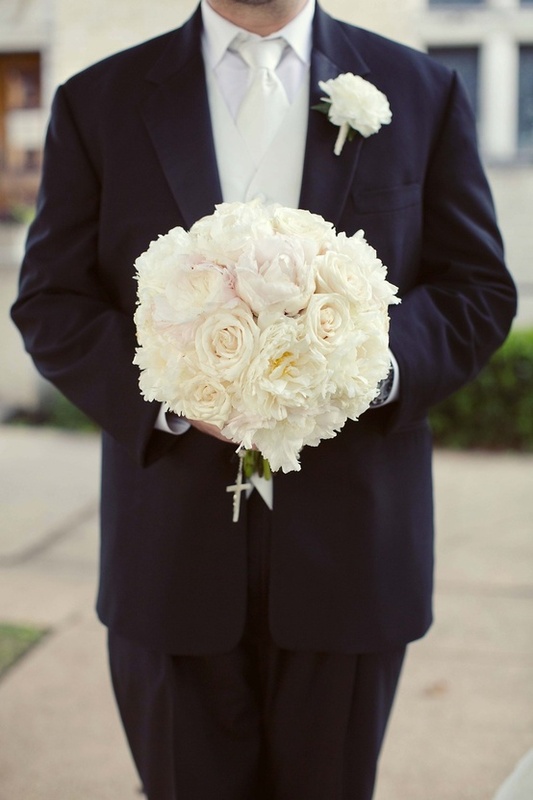 Corsages normally range from $10 – $12.. and a bouquet with peonies can cost from $150 – $200. 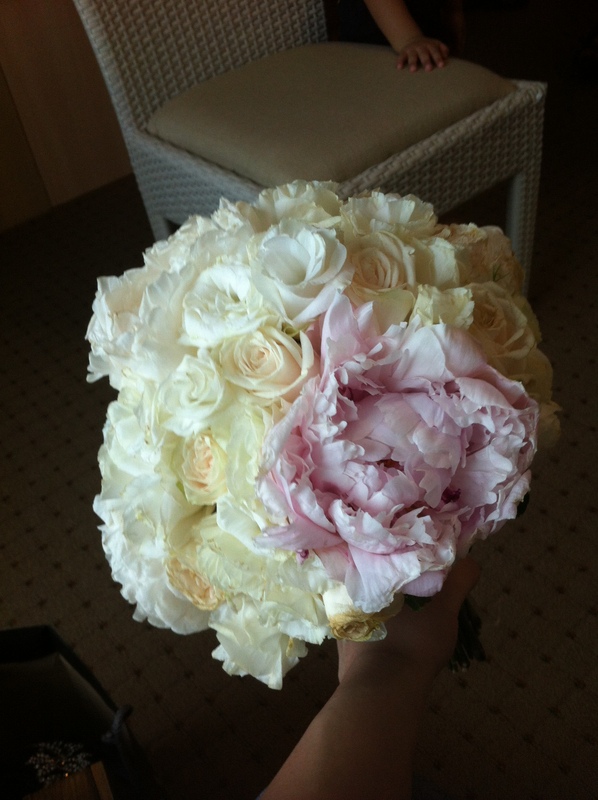 Picking up the bouquet will be done the night before the big day – 14th June 2013 at 6pm. .
I’m loving my bouquet already! Planning has slowed down a little. Most projects I’ve gotten started with are finished are stored neatly and safely in my wedding cupboard. Yes I have a wedding cupboard. Doing things myself sure isn’t as fun but I don’t have a choice, M’s busy and not too great with the crafts so I’d rather him not touch them. Mum is busy working and BFF is still down under, so most things are done by myself. Tip to other brides: Don’t do things by yourself. You can easily get tired and unmotivated. Grab your girls if you can and if not, do as much as you can for as long as you can like me! Then rest and call for help. I’m using Google Doc’s Wedding Checklist to help me sort everything out. I love the document! it helps me plan my budget, keep track of my guests and best of all I can access it from anywhere since its uploaded on the google drive. Next on the checklist: Booking of Caterers and Florist. I think I’m gonna do research on the caterer I want. Full break down, and I’ll share my findings with you. As for my Florist, my package is linked to 86 Creation Florist; anyone used them before? I think I’ll wait till December when BFF is back to visit her.